The Koide formula is a remarkable equation relating the masses of the 3 leptons. When it was first written down, it did not in fact predict the mass of the tau to within experimental error. Turns out though that the experiments were wrong. A decade or two passed: it turns out that the Koide formula is extremely accurate. The Koide formula has been compared to Descartes theory of circles: One can see that the two relationships bear a resemblance. Jerzy Kocik, in his paper called “The Koide Lepton Mass Formula and Geometry of Circles” uses this correspondence to determine that the Koide formula looks like a generalization of Descartes Circle equation – with a characteristic angle of about 48 degrees. 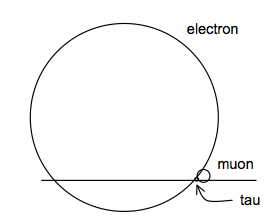 If one uses this formula, then the radius of the electron is actually the biggest, and tau smallest, (with a further particle having no or almost no mass…- ν ?). So are there any physical models that work well with the lightweight electron being large? Koide – 2012 geometry paper – uses inverse mass as Descartes curvatures, so electron bigger than muon. Gravity vs. Quantum theory: Is electron really pointlike? Implies huge electron, but as Burinski points out, this might not be the size we see when accelerated, etc. So if the Koide formula is real, then it describes some relationship between the areas (using the geometry paper) where they overlap at some 48 degree angle (look at diagrams). The naked kerr solution describes a wormhole like situation, so we could get the mass oscillation that I am looking for. If the electron is larger than a proton then the issue of the electron not orbiting down and discharging the proton is a non issue as the electron has already done this with the proton inside the larger electron. The Koide offers 2 answers for the mass of the tau 3.317 MeV or 1777 MeV. I call it the Klow and Khigh, The Khigh seems to be the tau. What is the Klow? If you play with the Klow 3.317 MeV with the Koide formula it will hit a -pion within 1 percent without fudge numbers. Interesting find for myself but I am not filled with a warm feeling of understanding of what the Koide formula is saying. And there is a proton and kaon hit from the Koide that keeps teasing that the Koide is somehow fundamental to the fixed masses on the standard model.